At the risk of sounding like an old curmudgeon, I have some things to say about the Banksy/Colossal Media "collaboration" which went up a few days ago on Wooster and Grand streets in NYC. Street Art and Graffiti have always been not only artistic acts, but political ones as well: challenging popular conceptions of how, and by whom, the public environment is utilized. The criminalization of these practices over the past 30+ years speaks to the top down control of public space, which seeks to define the terms on which our public spaces are used. The privatization of our public environment, including the walls of our buildings, has placed our shared environment out of reach of many in an effort to diffuse competitive uses of those spaces. Graffiti and Street Art should be understood as just such a competitive force against the determined efforts of public advertising to prevent all other unsanctioned visual uses of the public realm. To say that a collaboration like this between Street Art and the public advertising world "takes the air out of this works impact" is an understatement. 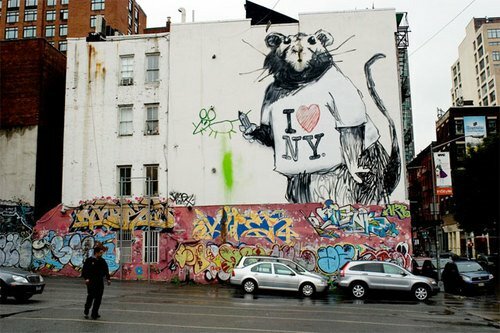 On top of this general complaint, Banksy ironically uses the I ♥ NY campaign created by Milton Glaser and promoted by the Association For A Better New York (ABNY) which was in many ways interested in removing the stigma which Graffiti had attached to the city in some of our darker economic times; Though things just might get worse now than they did back in the late 70's. Maybe we can let this one go since Banksy's not from around here, but New York street artists should be aware of the fact that the criminalization of Street Art and Graffiti was promoted by those agencies like the ABNY who were responsible for this benign slogan which tried to clean up, and helped to cover the true images of New York that many young Graffiti artists were trying to reveal. See Taking the Train by Joe Austin and Branding NY by Miriam Greenberg. I must add that Colossal Media is one of the less intrusive outdoor media companies, often painting their murals as opposed to using the more profitable vinyl signage, as well as working directly with street artists as pictured.